The New York Times continues to examine the nuances of the housing meltdown with a story on Mark Guerette, a Floridian who is claiming blighted, abandoned homes, fixing them up, and renting them to needy families at low rates. In a sign of the odd ingenuity that has grown from the real estate collapse, he is banking on an 1869 Florida statute that says the bundle of properties he has seized will be his if the owners do not claim them within seven years. A version of the same law was used in the 1850s to claim possession of runaway slaves, though Mr. Guerette, 47, a clean-cut mortgage broker, sees his efforts as heroic. “There are all these properties out there that could be used for good,” he said. 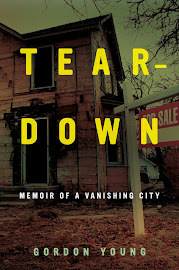 Given Flint's abandoned housing problem, the story certainly resonated with me. The only problem? Guerette could end up in jail, and his tenants could end up on the street. Flint needs to do what people did in the 80's on the Lower East Side. Squat. Go in, stay. NYC went through an economic resurgence in the 90's and thus all those squatters are now sitting on $10 million dollar buildings. Won't happen in Flint, but why not squat? The banks seem to have no concern with what's best for citizens and neighborhoods. It's clear they'd rather lose money by foreclosing and letting houses sit empty rather than cut deals and get people into these homes. It's a shame. The housing crisis is over according to experts. All that is left is an abysmal industry. Flint: The Biggest Southern City in the North? General Motors' High Powered I.P.O. The White House on G.M.